My friend asked me if I had any gluten-free recipes for cupcakes, since her turn was coming up to send goodies to school. The only problem with sending these is the "sending" part. Who can resist rich, moist, dark chocolate? 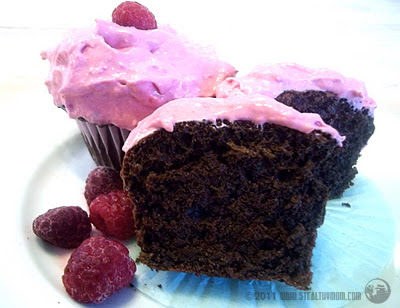 Topped with all-natural Raspberry Cream Cheese Frosting, these little cupcakes are grown-up enough to serve any crowd. Preheat the oven to 375F. Line a muffin tray with paper liners, lightly coating the inside of each with olive oil using a pump sprayer, or spray with non-stick cooking spray. Mix the dry ingredients together, using a sieve if needed. The Xanthan gum must be evenly distributed before adding the liquid ingredients. In another bowl, beat the eggs with a whisk, then cream in the yogurt, butter, sugar and vanilla. Add the dry ingredients to the wet and mix well. Fill the muffin liners. Bake for 17-18 minutes. This recipe is linked to Fat Tuesday, Gluten Free Wednesdays, Allergy Free Wednesday and Allergy Friendly Lunchbox Love, Fight Back Fridays and Empty Your Archives. These look wonderful! Thank you so much for sharing at Allergy-Free Wednesdays! Hope to see you again next week!